If you hadn't already guessed, I'm a big fan of easy and frugal projects that give my children fun opportunities to learn. 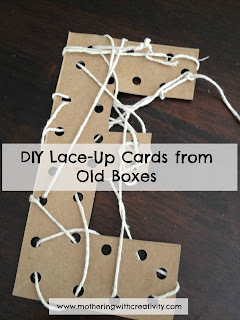 For years I have made my own tracers and lace-up cards from old boxes in my preschool and kindergarten classes. We made some today using the first letters of my kiddos' names. They are super simple to make. Ready? Find an empty box. You can use thick cardboard, but it will be harder to hole-punch (though thicker cardboard would work wonderfully if you plan to just use them as tracers). Cut out shapes in the box. Today we did letters. You can also do shapes to go with a theme your child is interested in, or any number of shapes. You can free hand them or find a template online, print, trace, and cut it out on your cardboard. I have done apples, balloons, trucks, flowers, squares, trees, and more. Use a hole punch to punch holes around the edge of your shape. Tie a string to one of the holes, and let your child use her fine motor skills to lace up the shape. You can encourage your child to go from hole-to-hole, perfectly around the edges, but younger children will often just place the strings wherever seems good to them. Either way, it's great fine motor practice! Older children who are able to lace in a particular way (back and forth in order, looping around the edges in order, skipping every other hole, etc.) will be incorporating problem solving skills in this activity. You can use these hole-punched cards as tracers, too, which is another great skill to practice. 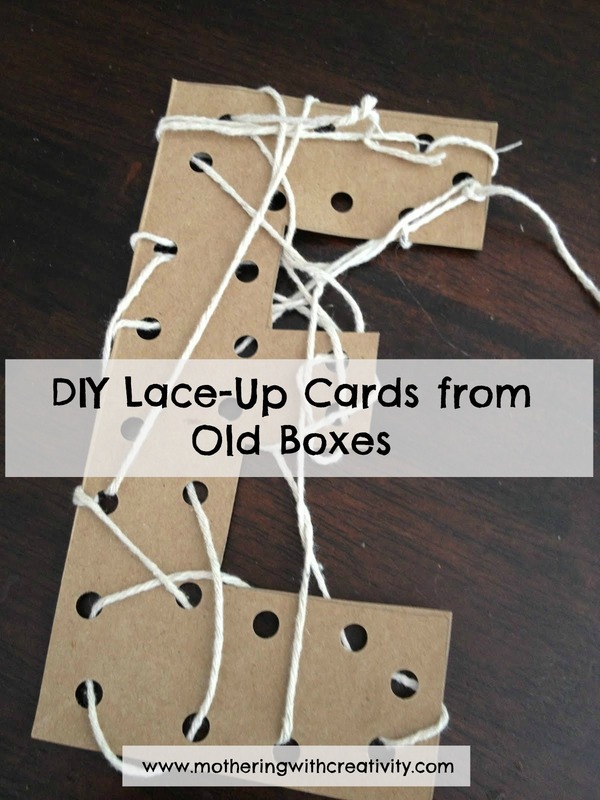 Just untie the string and have them trace around the edges onto a piece of paper. Thank you! I love your site...so cute! Awesome! I've made these in animal shapes, but hadn't thought to make letter shaped ones. Great idea! Animal shapes would be fun! When I taught preschool, I would buy the die-cut shapes in various themes from the Dollar Store. Then I would trace them onto cardboard for the kiddos to use. You could probably print out shapes, etc. to trace online, too!